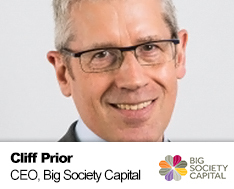 Cliff Prior CBE took up the leadership of Big Society Capital in March 2016. Prior to that he was CEO of UnLtd, the UK Foundation for Social Entrepreneurs, for the last nine years. UnLtd has supported 13,000 people to start new social ventures, with cash, coaching and connections, and backs people from start-up to investment readiness and major impact. Before UnLtd, Cliff was CEO of Rethink, the charity for people affected by severe mental illness, which is both a mass membership campaigning charity and a major provider of mental health services to the NHS and local authorities. His earlier career includes work in counselling, youth, civil rights campaigning, social housing, supported housing, community care, offender resettlement, learning disability, dementia, research and development, and mental health. Cliff is also a founding trustee of Clore Social Leadership, a non-exec at health innovation agency UCLPartners, and member of Comic Relief’s UK Grants Committee. He also chaired the mission alignment group for the G8 Social Impact Investment Taskforce. He has been an adviser to Government on health and medicines regulation, NHS modernisation, skills, and civil society. He has set up several ventures over four decades of work in the social sector.